Building Aiken's future one ribbon cutting at a time. 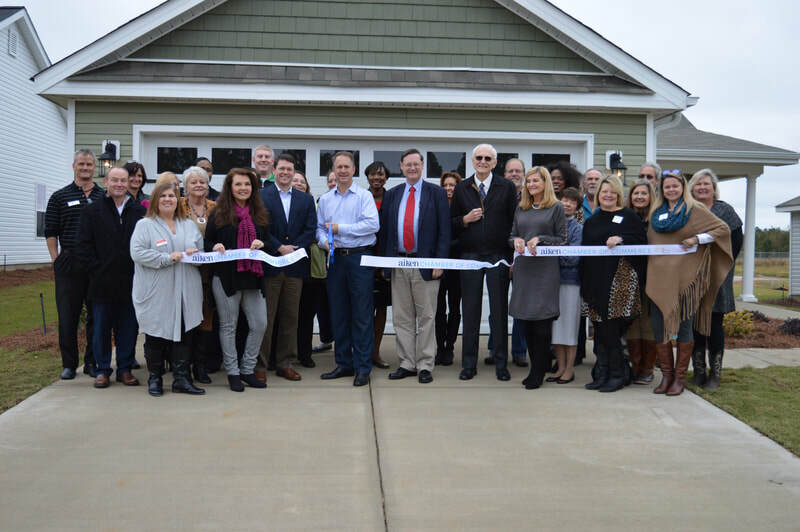 Summerton Village by Bill Beazley Homes held a ribbon cutting Nov. 15 to celebrate the opening of the newest Beazley home neighborhood near Whiskey Road and Talatha Church Road. Stephen Beazley is cutting the ribbon and joining him on the left is Aiken Chamber Chair Josh Stewart and on the right are Aiken County Council Chair Gary Bunker and Bill Beazley, founder of Beazley Homes. Learn more at billbeazleyhomes.com. 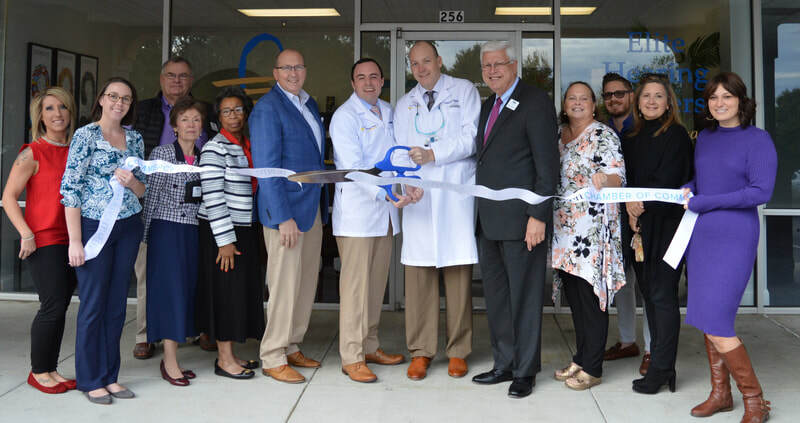 Elite Hearing Centers of Aiken held a ribbon cutting Oct. 25 celebrating the opening of their new facility located at 256 East Gate Drive in the Publix Shopping Center. Cutting the ribbon is Zachary J. Spellman, H.A.S. on the left and David Tague, H.A.S. on the right. Elite Hearing Centers offers hearing testing and a full-range of hearing products for its clients. Learn more at ellitehearingcenters.com. 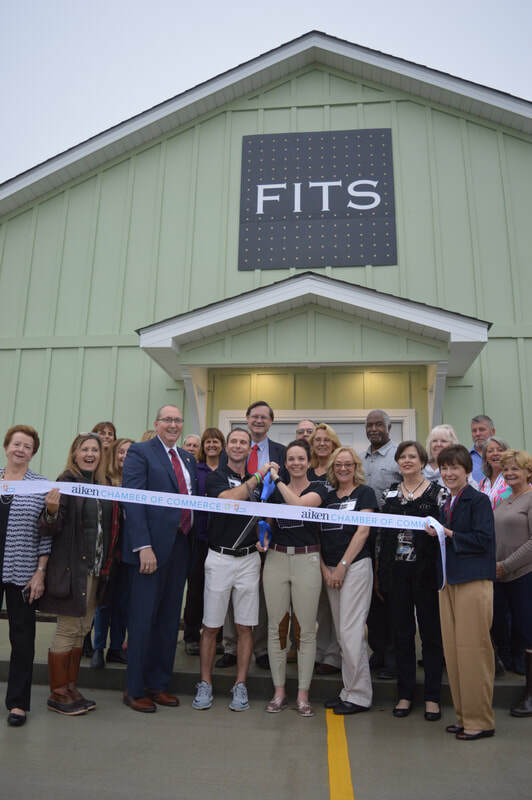 FITS Riding Ltd held a ribbon cutting Nov. 9 to celebrate its new retail outlet store at 111 Warehouse Road. FITS designs and produces technically innovative equestrian wear. Cutting the ribbon are owner Lida Bard and Chris Ott. The outlet store is open Mon.- Fri. 9 a.m. to 5 p.m. Learn more at fitsriding.com. Honda Cars of Aiken, 550 Jefferson Highway, celebrated a 12-month expansion and remodeling project that includes an expanded service department, customer lounges and increased customer parking and inventory lots. Celebrating at the Oct. 25 ribbon cutting are from left to right Emily Speer, Honda Motor Company; Greg Hodges, Stokes Hodges Automotive; Mike Whisenant, General Manager; Eddie Stokes, Stokes Hodges Automotive; Steve Cloninger, Honda Motor Company; and Devon Batchelor, Allen+Batchelor Construction. Learn more at hondacarsofaiken.com. 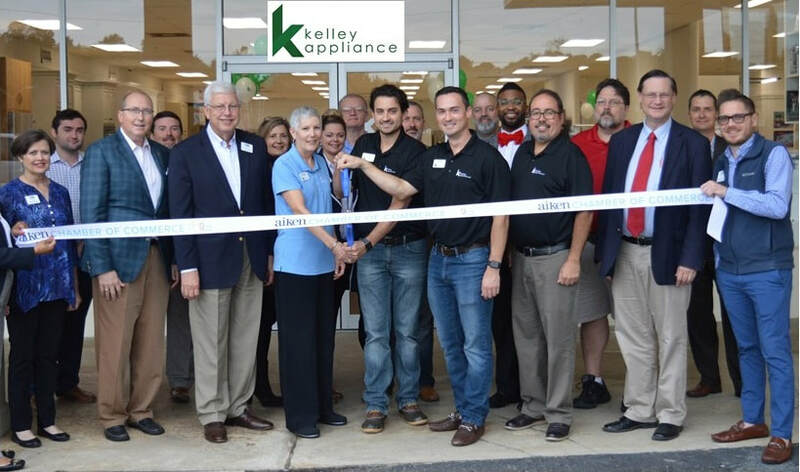 Kelley Appliance located at 1551 Whiskey Road in the Mitchell Shopping Center held a ribbon cutting Nov. 2 honoring its grand opening in Aiken. Cutting the ribbon in the center is showroom manager Andree Wallgren, co-owner Seth Duncan, co-owner Zach Zapata and sales and customer service associate Race Clark. The showroom is open Mon. – Fri. 9 a.m. to 6 p.m. and Sat. from 9 a.m. to 4 p.m. Learn more about Kelley Appliances at kelleyappliance.com/. 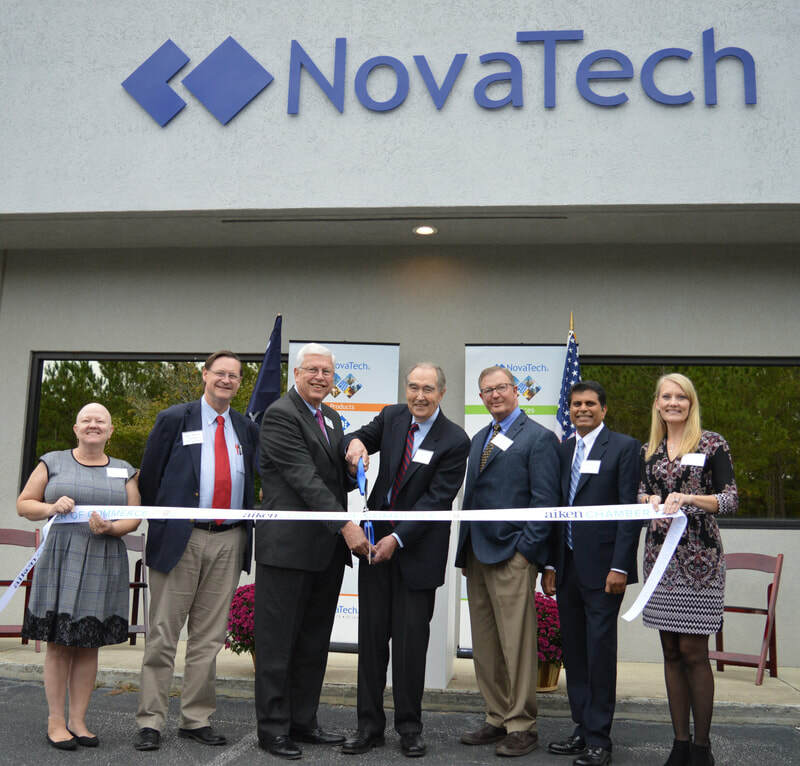 NovaTech Process Solutions, LLC held a ribbon cutting Oct. 25 to celebrate its new location at 139 Darlington Drive, Suite 200. 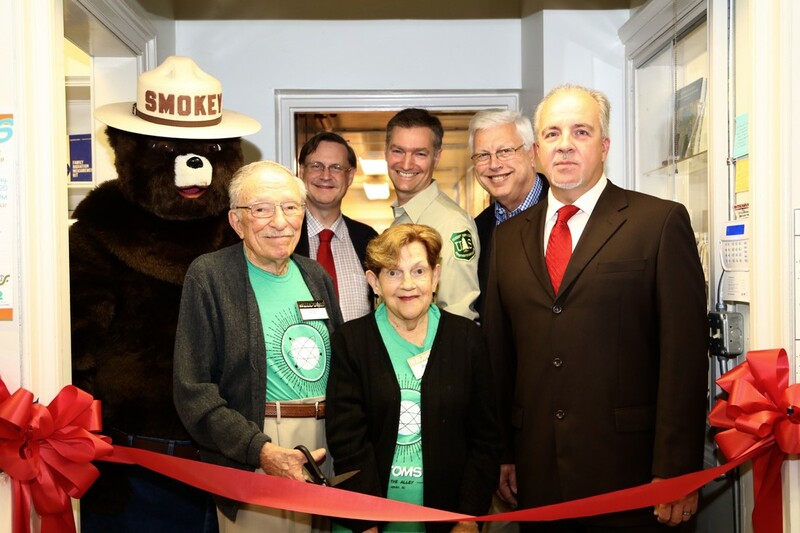 Pictured from left to right are project manager, Anita Donath, Aiken County Chairman Gary Bunker, Chamber President/CEO J. David Jameson, CEO Volker Oakey, Senior VP Jeff Lindtner, COO Ramesh Nuggihalli, and Corporate Communications Director Caroline Frisks Wood. NovaTech is a U.S.-based supplier of automation and engineering solutions for the electric utility and process manufacturing industries. 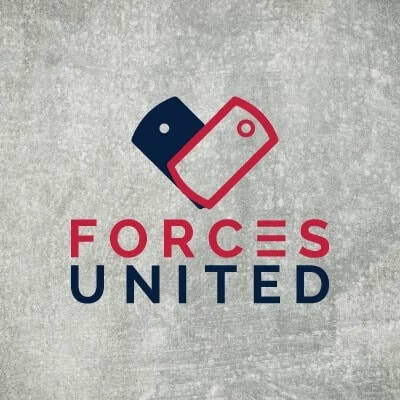 Learn more at novatechweb.com. 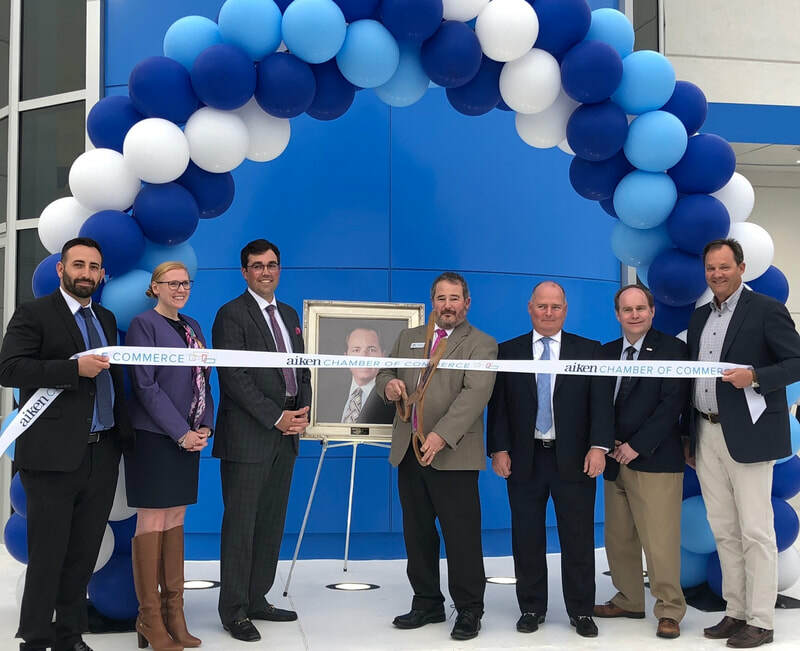 PVD Internal Medicine Associates held a ribbon cutting Nov. 8 at 440 Society Hill Drive SW Suite 203 to celebrate the opening of the office of Alyssa M. Degnan, DO. Aiken Mayor Rick Osbon helped Dr. Degnan cut the ribbon. They were joined by her family, office staff, Aiken Police Chief Charles Barranco, Aiken County Public Schools Superintendent Dr. Sean Alford and Aiken Chamber of Commerce Chair Josh Stewart. Contact the office at (803) 226-0343 for more information. 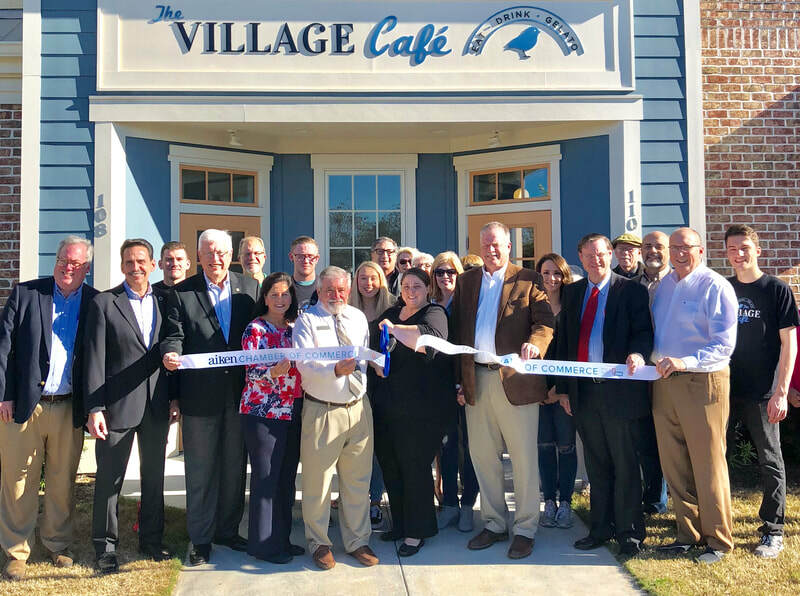 The Village Café, located at 110 Coach Light Way held a ribbon cutting Oct. 29 honoring its grand opening in Aiken. 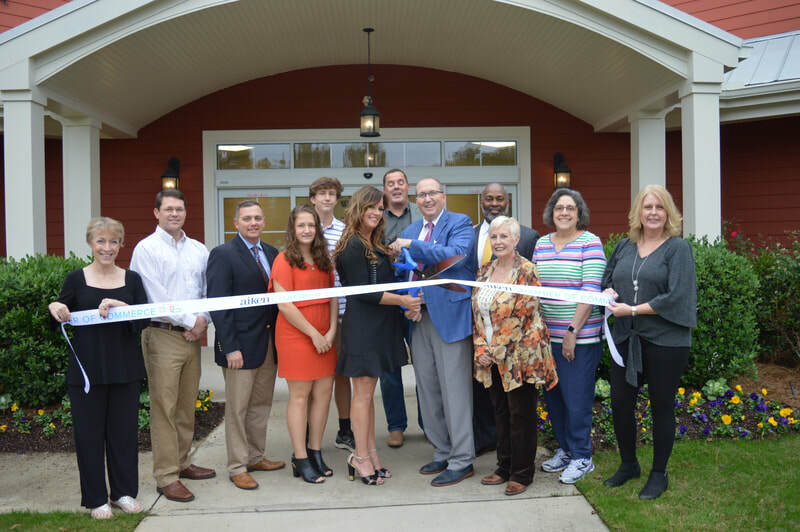 Cutting the ribbon is manager Sarah Bassham (center) along with Michael McFadden, vice president of food and beverage for the Village at Woodside (left) and co-owner Charlie Hartz (right). The Village Café is open Mon.- Wed. 7:30 a.m.to 4 p.m. and Thurs.- Sat. 7:30 a.m. to 8 p.m. Learn more about The Village Café at thevillagecafeaiken.com. 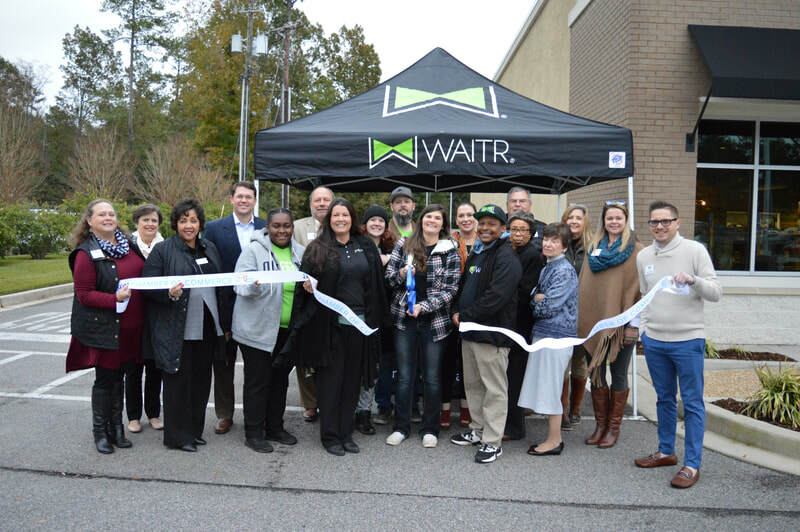 WAITR held a ribbon cutting Nov. 15 to celebrate its expansion into the Aiken market. WAITR delivers food from local restaurants to diners in the CSRA. Cutting the ribbon are brand ambassador, LaTreal Strickland; Amy Weaver, business development manager; WAITR driver, Caitlyn Ennis; WAITR city manager, Cierra Williams; Jerel Inge, regional marketing manager along with Aiken City Council member Gail Diggs, Chamber chair Joshua Stewart and members of the Chamber’s ambassador team. Learn more at waitrapp.com. Walmart Aiken South #0514 celebrated their recent store renovations at 2035 Whiskey Road. 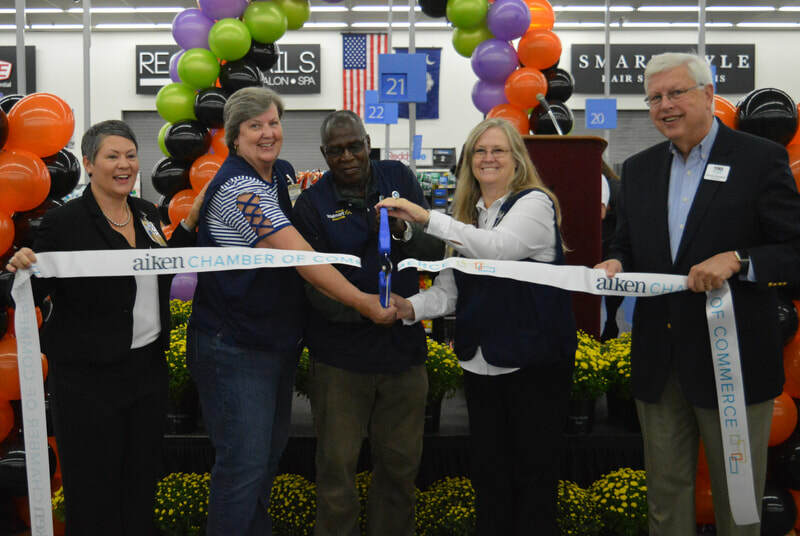 Store associates with 20 years of service joined Aiken Chamber President/CEO J. David Jameson in cutting the ribbon. From left to right are Walmart Market Manager Lisa Ratcliff, Sandra Widner, George Hightower, Lee Smith and Chamber President/CEO J. David Jameson. Learn more at walmart.com.